French oil major Total is conducting seismic testing on a block it operates in northeastern Democratic Republic of Congo, a company spokeswoman confirmed on Thursday, making it the first oil major to conduct such testing in the country. The pledge was originally made by Christophe de Margerie in June 2013, when he said that Total “will refrain from prospecting or exploiting oil and gas in natural sites inscribed on the World Heritage List as at June 4, 2013.” This stance was reaffirmed in a letter sent to UNESCO in December 2013. “This commitment is another building block of our environmental policy,” said Bertrand de Nadaillac, Senior Vice President, Environment & Health at Total. “We have long been engaged in protecting biodiversity and will continue to safeguard ecosystems wherever we operate.” Total introduced an official Biodiversity Policy in 2005. It is predicated on minimizing our environmental footprint and paying special attention to areas whose biodiversity is particularly rich or vulnerable. Some environmental NGOs have interpreted the exploration license in the Democratic Republic of the Congo as a sign that Total intends to operate in Virunga National Park, home to the largest gorilla population in the world. But our response is unequivocal: we made it clear in May 2012 that we would not operate in the park. 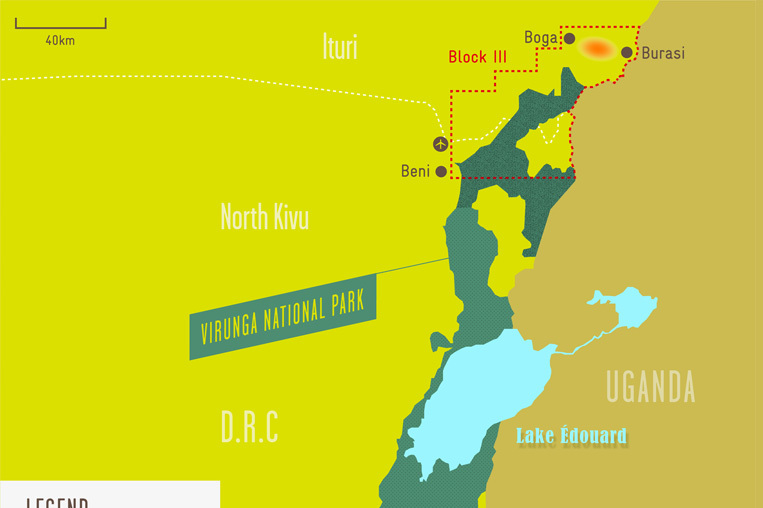 How attractive hydrocarbon prospective location is Block III, when it covers 32% of Virunga National Park? SacOil saw an airborne gravity and magnetic survey conducted over the northern part of Block III in the Democratic Republic of Congo (DRC). The acreage is outside the Virunga National Park. The company said that the interpretation of the survey, acquired by the operator Total, confirms the geological trend observed in the adjacent concessions in Uganda. Features similar to those found to be oil-bearing in Uganda in the Albertine Graben have been observed and identified with the new data. With this positive geological information, planning for the acquisition of a 2D seismic survey has begun. The current design envisages the acquisition of a minimum of 400 km of 2D seismic data. Completion of the survey takes Total E&P RDC a step closer to ascertaining the presence of oil or gas in the area SACOIL on Wednesday announced that Total E&P RDC, the energy multinational and operator of Block 3, Albertine Graben, in the Democratic Republic of Congo, has successfully conducted an airborne gravity and magnetic survey on the northern part of the Block 3 area, outside the Virunga National Park. The completion of the survey takes Total a step closer to ascertaining the presence of oil or gas in the area. Discovery of hydrocarbons in the block will boost SacOil’s balance sheet. SacOil owns a 12.5% interest in Block 3. Preliminary processing of the Block 3 gravity and magnetic data broadly confirms the trend observed in the adjacent concessions in Uganda. “It is expected that more detailed processing will identify features similar to those that were found to be oil-bearing in Uganda,” SacOil said. SacOil CEO Robin Vela has in the past said there is a huge potential in the block because of oil and gas discoveries in Uganda which he says suggest that Block 3 is in an attractive hydrocarbon prospective location. Until now, exploration in the area has taken place within the borders of Uganda. SacOil said planning a two-dimensional seismic survey, to map potential oil and gas prospects, was under way and Total had initiated a tender process.”Subject to the positive identification of structures that may contain oil and gas, Total intends to drill an exploration well in order to determine the presence of oil or gas and the potential commercial viability of Block 3,” SacOil said. In terms of the farm-in and joint venture agreements on Block 3, Total bears all the costs associated with the acquisition of the airborne gravity and magnetic survey and will carry SacOil through the seismic survey, any subsequent exploration and appraisal wells, up to a final investment decision. As a result, SacOil will not be required to contribute any further capital to this project until the final investment decision. Block 3 is 66.66% owned by Total, 18.34% by Semliki Energy (a company incorporated in the Congo ), with the remaining 15% belonging to La Congolaise Des Hydrocarbures, the state-owned oil firm of the Democratic Republic of Congo. In addition to the 12.5% interest in Block 3, SacOil also has a 20% interest in OPL 233, an offshore oil block in Nigeria’s Delta region. OPL 233 is scheduled to start producing next year, with a minimum production of 10,000 barrels per day. SacOil also has a 20% interest in OPL 281, an onshore block in the western Delta region of Nigeria. Oil extraction from 281 is expected in 2014. It is expected to produce in excess of 30,000 barrels per day. WWF has called on French oil company Total to refrain from exploration in Virunga National Park. At a meeting of Total shareholders and investors Friday, WWF hosted a demonstration and published an open letter to the company president. Total has been granted an oil concession that includes a portion of the World Heritage Site, which is recognized as a treasure of biodiversity. WWF is asking Total to declare Virunga and all World Heritage Sites off limits for oil development. WWF is concerned that oil exploration could have negative impacts on communities that depend on the park for their livelihoods and on endangered species that live in the park, such as mountain gorillas. To illustrate to Total investors the threat oil development could have on mountain gorillas, volunteers marked off a symbolic crime scene at the company’s annual meeting and launched an online petition. Virunga National Park, located eastern Democratic Republic of Congo, was the first national park to be created on the African continent over 85 years ago. With its exceptional ecosystems, it also is especially known for hosting over 200 species of mammals including the rare okapi, protected since 1933, but also the mountain and lowland gorillas, two sub-species in critical danger of extinction. It is thanks to this unique ecological value than Virunga National Park was declared a World Heritage Site by UNESCO in 1979. For WWF and its members, the preservation of Virunga National Park is of paramount importance as it is written into the history and identity of our international network which was created in 1961. This irreplaceable jewel is now under threat. Sir, you are aware that one of the oil concessions that overlaps the park area is in the hands of Total. Therefore, we take the opportunity of this annual general meeting to publicly alert you and your shareholders on the dangers posed by your company to the Virunga park and its treasures. We cannot believe that an industrial group like yours, which upholds the value of sustainable development, can be insensitive to the risks that oil exploration would pose to this area. That is why WWF asks you to state publicly that the current boundaries of the Virunga park and all the World Heritage Sites are a “no go” for your company.